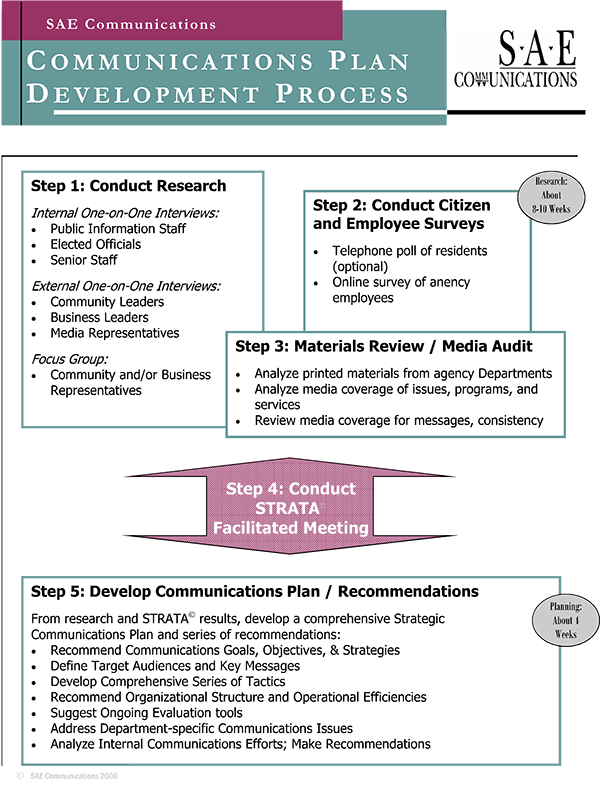 SAE Communications was established to help local public agencies analyze their existing communications efforts and create strategic plans that support organizational goals and objectives. We’ve married the needs of the public sector with the proven approaches of the private sector to help agencies educate, engage, inform and listen, to their publics. We believe strongly in the value of conducting appropriate communications research prior to embarking on any form of communications planning. Without a clear picture, for both our firm and for staff, of the organization’s business objectives, key messages, and current level of communications effort, it is impossible to recommend strategies, tactics, and other program elements. Purpose: To gain a qualitative understanding of the perceptions of key audiences, generate buy-in to the process/plan through their early participation, develop an inventory of all relevant communications tools, and gain an accurate external perception of the agency’s operations. Purpose: To gain a measurable, projectable assessment of the views of the overall population. Purpose: To gain an understanding of how issues are perceived by leadership and staff. Purpose: To gain an understanding of how issues are perceived by a broad range of community members. Purpose: To gain a quantitative and qualitative assessment of employee perceptions of the agency’s communications vehicles and processes. Purpose: To analyze existing tools, including message consistency, appearance, communications effectiveness, representation of all employees and all community segments; and to gain an understanding of breadth, balance, and accuracy in media coverage. Purpose: To provide a clear blueprint for future communications activities in order to reach, and hear, external and internal audiences in the most creative and efficient manner possible. See a few case studies here.